"Unknown Armies" is an official RPG system. I happen to be using the second edition, which can be found here. 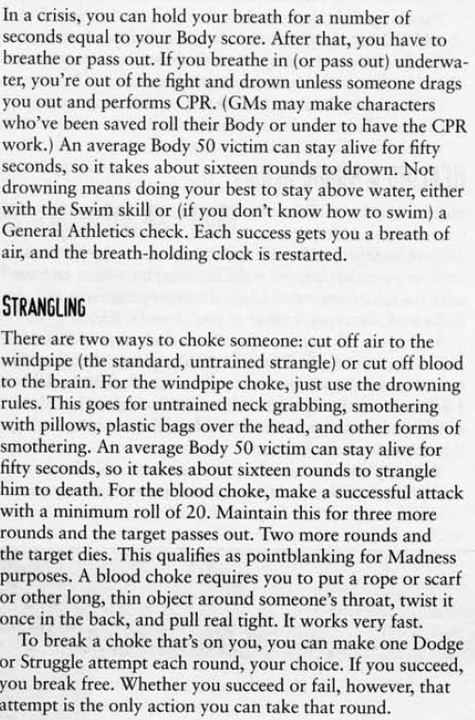 To save people from reading the rulebook, I have written two write ups. There is a longer version and a condensed version. The condensed version is down below, which is probably all one needs to play (the longer version is a little excessive). The longer version I was unable to cleanly copy onto this website (spoilers went to hell, links didn't copy). As an alternative, here is a link to the write up on Minegarde. If you would prefer a Google Docs version, I could share that with you (you'll need an account). I could also email a Word document. If you have any questions, please ask (any way works). 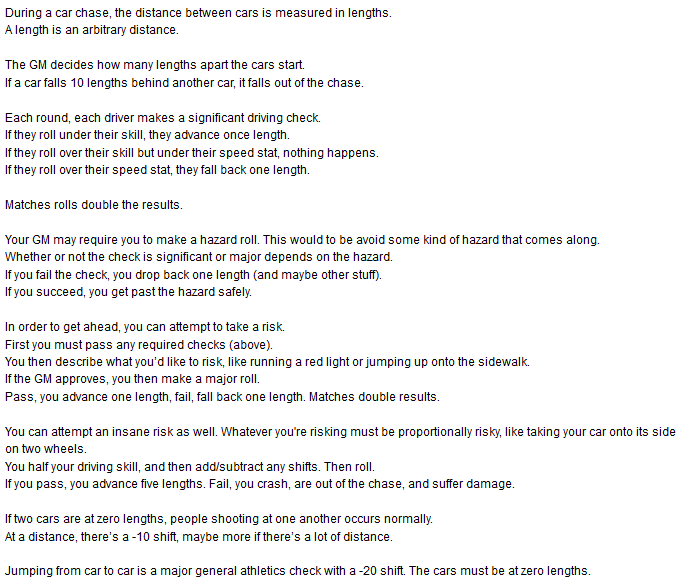 This is a condensed write up of the rules, shy of 1,600 words (plus what's inside the links). There are four stats; body, speed, mind, and soul. Between 30 and 70 is the average range for humans for each stat, 50 being very average. Stats (usually) cannot go beyond 99. Using body as an example, however many stat points you spent on body is how many skill points you get to spend on skills tied to body. You may receive “free skills,” which are just skills given to you starting at 15. You are allowed (if not encouraged) to make up skills. However, the book does have some pre-made skills. Your GM may edit or not use some of them (some are basically required though). General Athletics, Fighting, Other Examples. Dodge, Initiative, Driving, Other Examples. NOTE: Initiative automatically starts at HALF of your speed stat. General Education, Notice, Conceal, Other Examples. Whenever do you something that warrants a roll, a roll is made between 0 and 99. There are three general scenarios of varying urgency. Minor, significant, and major. These are some loose guidelines separating them. To summarize, minor means little is at stake, significant means something is at stake but maybe not life threatening, major may mean life threatening and crazy hard (combat is always major). With minor, as long as your skill is 15 or above, you succeed. Your roll might determine how long it takes or something. If you roll over your tied stat, you fail. You can also decide to use a relevant stat (if you don’t have the right skill). Reduce the stat by 30 and roll. If you roll under the stat (with the reduction), you succeed weakly. With major, you must roll underneath your skill to succeed. 00, called a fumble. You screw up really bad. 01, called a critical. You succeed practically perfectly (this does not mean doing the impossible though). Matched (11, 22, 33, etc. excludes 00). A more dramatic result, which could be good or bad. Matched success, you succeed better than normal. Matched failure, you fail worse than usual. You may be required to make a “minimum roll,” for whatever reason (probably difficulty). Your roll must meet the normal requirements (ex: below skill), but also be above whatever the minimum roll is. “Shifts” may be applied, which can be good or bad. Perhaps your target is holding still, making things easier. Perhaps you’ve got heavy stuff on your back, making things harder. Shifts generally range from -30 to 30 in increments of 10 (-30, -20, etc.). They are added to your skill/stat. You chose one of your skills to be your obsession skill. This should be something like your character’s defining trait, or what they’re best at. With your obsession skill, you are allowed to “flip flop” rolls. Say you rolled 72, you could turn it into 27, or vice versa. This can really save you. This table gives an idea of how much more useful a skill becomes when obsessed. You start out with a number of “wound points” equal to your body stat. As you take damage, the number of wound points you have is reduced. If you hit 5 wound points, you’re incapacitated in some way (knocked out, shock). If you hit 0, you’re dead. When your wound points reach somewhere between two thirds and three fourths (GM discretion) of your total, you suffer a -10 shift to all relevant skills and stats (whatever makes sense). When your wound wound points reach somewhere between one third and one fourth, you suffer another -10 shift, or a sum of -20. Your GM never tells you exactly how many wound points you have, or how many you just lost. They will try to indicate such through description. Wound points can be recovered overtime or through medical treatment. Combat goes by in rounds. Each round is ROUGHLY 3 seconds (don’t get caught up on that). Each round, each person gets one action (usually). There is an order of who goes when. Who goes when is determined by the initiative skill. The higher your initiative, the sooner you go. Remember that combat is always major. You make your fighting (or shooting) roll. If you get under your skill, you succeed, over, you fail in some way (perhaps opponent parries, it’s only a grazing hit). With hand to hand damage, the damage dealt is the sum of the two digits. For example, 67 would be 6+7=13 damage. 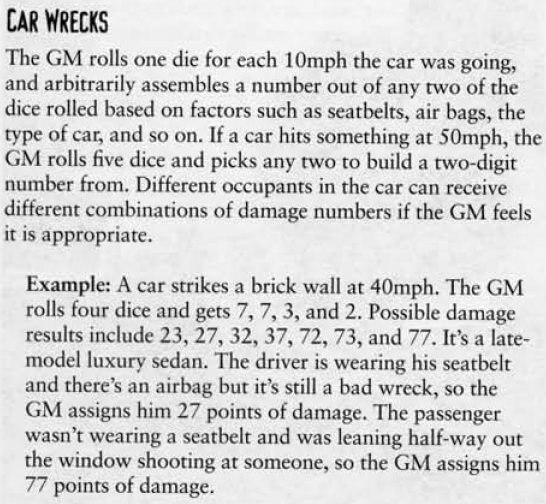 (Note that 0 is treated as 10, so 07 would be 17 damage). With firearms damage, the damage dealt is simply the number rolled. 67 would be 67 damage. (Note that this is generally superior to HTH damage). Note, however, that there are often damage caps. Say you’re using a small pistol, the damage cap may be 20. That 67 only deals 20 damage. Rolling a 01 means you kill your target right there. 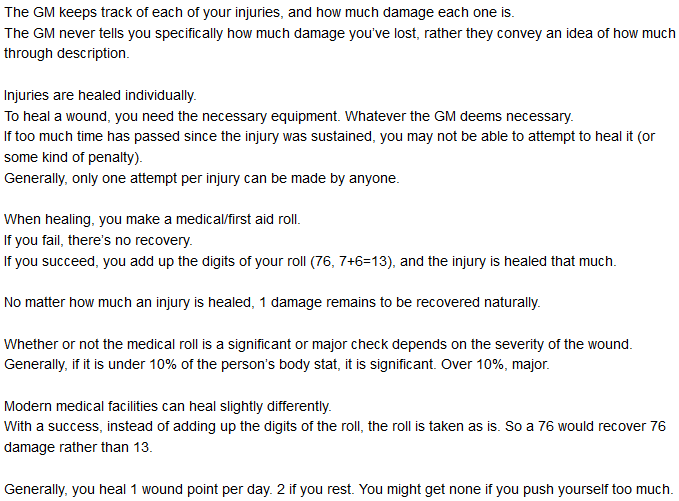 Melee weapons do not affect rolls, they simply add damage. With a weapon of +6 damage or greater, a matched success deals firearms damage. With any weapon, a matched failure means you take damage equal to the weapon’s damage bonus. A 00 means you hurt yourself badly (or perhaps your enemy counters deftly). 20 damage plus the bonus of your weapon. Firearms tables one and two. Firearms simply determine the damage cap. Matches rolls have no special effects. 00 means the gun jams or misfires. Dodging applies to both firearms and melee. It assumes you are doing everything in your power not to get hit. It does not mean flinching and regular blocking, because that stuff is already assumed. Dodging can be any means of avoiding damage, such as evasion, blocking, parrying, etc. If someone makes a successful attack against you, you roll your dodge skill. You must make a minimum roll of whatever your opponent rolled. If you succeed, you take no damage (above minimum and below skill). If you fail (over your dodge skill or under minimum roll), but what your opponent rolled is below your dodge skill (not roll), you only take half damage. If what your opponent rolled is above your dodge skill, you take damage normally. You cannot dodge someone who acts before you (higher initiative). This is because they are attacking before you react or start dodging. However, you can start dodging one round, and continue dodging into the next round (in order to dodge people who are faster than you). There are three types of passion; rage, fear and noble. You get one of each. Explanation and examples: rage, fear, noble. When something triggers your passion, you get to reroll or flip flop a failed roll during the situation. Note what kinds of actions can be done for each passion (can’t use rage for picking a lock). Your reason for using your passion must be substantial. If you fear fire, seeing a campfire won’t be enough. The madness section was left out of this write up, but can be found in the main write up. You can get by without the following information, but some of it would certainly be helpful. Disarming, knock down, multiple attacks, throwing stuff, sucker attacks. Links one and two. When fighting is your obsession skill. Multiple shots/attacks (both firearms and melee on some points). Special Ammo and Bullet Proof Vests. Car Chases and Car Crashes. Hmmm... I got a few paragraphs in before continuing. Is anyone going to use these rules? I already have a bunch of fairly un-used rulesets memorized, and I don't want to add another one to that if nobody here is going to use this system. Star Lady is going to use it for her upcoming RPG (Wastelands), albeit a variation. She's also using it for another RPG one Minegarde. I tried an "experiment" on Minegarde, testing a mod for the system. I'm more or less in the process of another experiment. In any case, I will likely use it in the future. I added in some stuff at the bottom (for the upcoming Mercenary RPG), basically just screenshots of the larger write up on Minegarde. 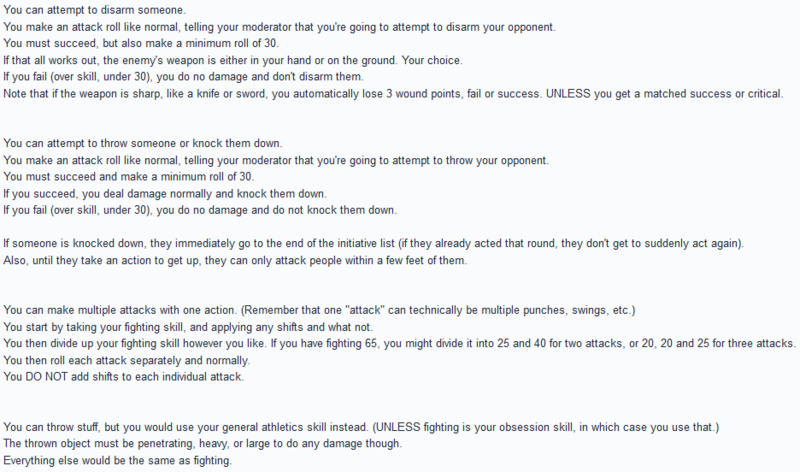 There's two links for disarming, throwing, knock down and some other stuff as well. Edit: I'm gonna have to get around to healing and driving. Added some links on the end. Car chases, car crashes, healing and recovery, drowning and strangling, and falling.